Easy Almond Joy Overnight Chai Pudding Recipe skips the sugar but delivers on flavor. I’m back to being sugar free! As of this date, I’ve gone 21 days without sugar – or chocolate – or alcohol. This is the second time I’ve gone sugar free. The trick to successfully kicking sugar to the curb is to find recipes you love that deliver on flavor without added sweeteners. I’ve been completely smitten with this overnight chai seed pudding recipe. It has all the components of an Almond Joy bar – coconut, chocolate and almonds – but none of the sugar. If you are simply looking for a healthy chia pudding, but have no interest in being sugar free, you have some options with this recipe. Start by adding maple syrup to the pudding then top it off with dark chocolate chips in place of the cacao nibs. YUM! This is also a good way to get the kiddos to try it. I prefer to make this with unsweetened almond milk. However, it would be awesome made with real coconut milk. The sweetness in this recipe comes from an added banana. If you really want to eat clean, look for a green tipped banana. They aren’t as sweet. However, they do have a good amount of resistant starch, which is good for weight loss. If you make this in a wide mouthed pint jar, you’ll have plenty of room to add your toppings, plus you’ll have a portable breakfast or snack! By the way, narrow mouthed jars don’t work – you can’t really get your spoon in. Add chia seeds and cocoa powder to a wide mouthed pint jar. Pour in almond milk while stirring constantly. When ready to eat, stir, then add sliced banana. Top with sliced almonds, coconut flakes and cocoa nibs. 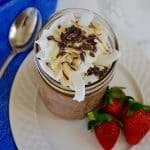 This overnight chai pudding recipe is perfect for a Sugar Detox, Paleo, Vegan or Whole 30 plan. So no matter what diet plan you or your family are following, you can all eat this!